I was watching a group of horses eating some hay they had just been fed. One pushy youngster came up to help himself to one of the other horses hay. This bothered the other horse who pinned his ears, snaked his neck out, and bared his teeth at the younster. The youngster kept coming up to the pile of hay, so the horse lunged out and bit the youngster on the side of the neck. This disturbed me so I asked the horse why he was so agressive. He said, "I wasn't being agressive. I gave him plenty of warning. He still came up so I exercised my authority and used enough force to move him out of my space. The next time he tries it I will give him another warning and he will probably move along." I told him that I thought the behavior was unacceptable and was too harsh. He replied, "See that other horse over there with all the bites on him? I don't want to end up like that. I am the alpha horse and the leader of this herd." We must become one with the horse. The horse doesn't have to become one with us. The horse sees no need to rise(?) to our level of sophistication. In order to become one with the horse, we *MUST* place ourselves in the horse's mind, we *MUST* understand how the horse "thinks", we *MUST* understand what the horse says and we *MUST* be able to communicate with the horse in a manner it understands. If we do not, we may become familiar enough with the horse to reasonably get along with it, but we are not ever going to be one with it. When I start working with a horse I almost always begin by doing the bonder with it in a round pen. By merely beginning the bonder I am saying to the horse, "I am prepared to be the one to direct what happens when you and I are together." Instead of saying of saying we'll see about that and trying to kick me into a mind change he decides he's going to take his marbles and go home. His fleeing tells me, "watch this, I'm not going to let you be in charge." My staying always the same distance from him as he flees, no matter how fast or long he goes says to him, "you are powerless to get away, you are part of *my* herd." Almost all horses will flee. Most are caught so off guard by a non-horse being using horse dynamics they attempt to leave. Some whip their heads, some cow-kick, some mule-kick and show other signs of indignation (from a safe distance) but they usually all leave. I am prepared for the one who is willing to fight me face to face and at the first sign of serious aggression I angle to his side and "attack" from there. In order to get away from me he has to flee. Once he flees, I have him. But in the pen, fleeing doesn't work. 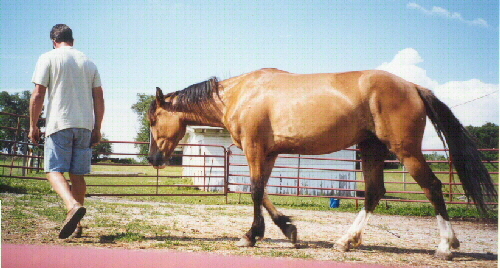 The horse says, by his ear position, "this acting like a horse being is obviously more dominant than I am. I am powerless. He is someone to pay close attention to." The licking and chewing is the horse saying, "I'm processing my options here, this is a situation I need to rethink." Since horses are by nature, herd animals, whose survival depends on being part of a herd, the horse immediately starts negotiating permission to rejoin the herd by showing submissive head postures, closing closer to me as it circles. It is then saying, "I accept you as being the herd leader." At that point I cease all confrontational body language which says, "okay, we have a deal, come on in," and the horse comes to me and awaits my direction. If I stand, it stands. If I move, it moves (I chose where we will graze). If the horse sees me as a person, he sees me as a person who is exhibiting mighty strong horse traits. Traits that have been a part of his genetics for millennia. I am totally against pre-emptive violence. or physical retaliation, unless the horse uses it on me in a rebellious manner. I will return like for like. I do not initiate it, but I will try to return it in a manner that will match the herd boss' response. I will treat him as a horse - not as a child, friend or what have you. If in the herd, he angrily bites the lead mare, she instantly attempts to knock his block off. And when it's over, he accepts it with no hard feelings. When he angrily bites me, I swell all up and become the lead mare. In moments, it's over, and we both go back to grazing with no hard feelings. If the horse doesn't respect my space I take my finger and give him a light poke and tell him, "Annnnt!" He then respects my space or we escalate the reaction and give him a quick bonder refresher and in minutes he's back in the agreement again. In each situation, he knows what he did, he got the response he expected. 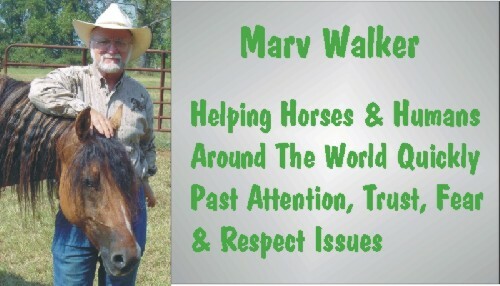 In a perverse way, in the horse's way of "thinking", I did what he trusted me to do as lead mare. By treating a horse as he expects to be, and would be, treated when left to his own devices in a herd, you operate in a manner the horse knows, understands and accepts. When a horse knows, understands and accepts something it is comfortable and confident. At that point you have trust. It's when you drag the horse into human logic and reasoning that you have problems.